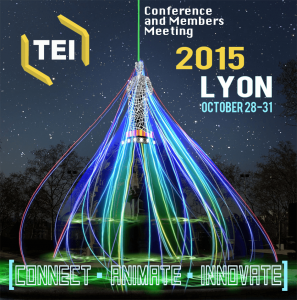 The annual Text Encoding Initiative (TEI) Conference and Members’ Meeting will be held for the first time in Lyon, from 28 to 31 Octobre 2015. The theme of this 15th conference is: « Connect, Animate, Innovate ». We hope that this event, international and interdisciplinary by nature, will attract about 200 scholars and technicians, coming from all the disciplines of the Humanities and Social Sciences and from across the academic disciplines. By welcoming this event to Lyon, the local academic community is delighted to celebrate its involvement in the field of Digital Humanities with colleagues from around the world. The CIHAM – Histoire, archéologie, littératures des mondes chrétiens et musulmans médiévaux (UMR 5648, attached to the ISH) and HISoMA – Histoire et sources des mondes antiques (UMR 5189, attached to the MOM) are two research centres based in Lyon, counting respectively about 120 and 200 scholars. Deeply involved in Digital Humanities, they both have a special programme to develop this field. The Text Encoding Initiative is at the heart of their many projects dealing with the study, edition and transmission of various types of texts and documents.